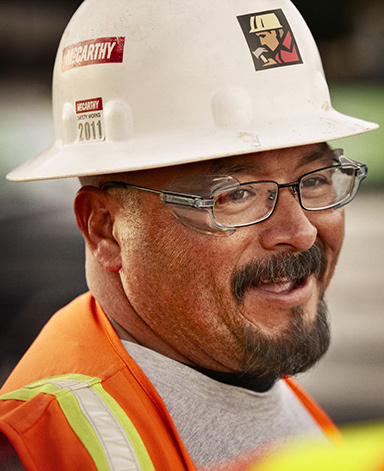 Experienced professionals come to McCarthy so they can do their absolute best work. Here they’re able to leverage the lessons learned and knowledge they bring into delivering the greatest results of their careers. We provide talented people with the tools, support and challenges necessary to make sure they are engaged every day. From the office to the field, our outstanding people are at the heart of every success we celebrate. If you’re an experienced, forward-looking professional looking to immerse yourself in an exciting, collaborative environment, let’s have a conversation. Regardless of where you are in your career, we’ve specifically designed our Management and Leadership Development training programs to equip you with the essential leadership and business acumen skills you’re looking for to amp up your career. Our personal approach for experienced professionals includes a blend of technical and leadership training, executive coaching, mentoring and more to help you achieve your goals. We’re just different from other builders, and we’re proud of it. When we say we’re 100% employee-owned, we mean it. Everyone has a stake in our company and everyone benefits from the rewards. Our Total Rewards approach is much more than salary and insurance. If you’re looking for a place where you will have the opportunity to work with high performing teams to produce dramatic results, and then reap the rewards, you’ve found the right place.